I’m not sure if it’s because I was born in 1986 and grew up with the idea that LA was the other major city in the US (along with NYC), but it absolutely shocked the hell out of me when I read that the Pacific Standard Time: Los Angeles Art 1945-1980 was the first time anyone had ever taken a good hard look at the post-war art of Southern California. Not only that, I couldn’t believe that it was the first attempt to distinguish it from East Coast art and its art historical vernacular. In my less informed days, I would not have seen a problem with So Cal art being forcibly adhered to an East Coast standard (because it’s all American art, after all). However, now that I am wiser and more well-read, I can easily see that there are a lot of problems with lumping all post-war American art under one avant-garde flag. While I was reading West of Center (you can see my post here) and doing further research into reviews of the exhibition, I came across this review in Westword by Colorado-phile Michael Paglia. He quoted art critic David Hickey’s scathing response to the show: “It’s corny... It’s the kind of thing Denver would do. They would do Mountain Standard Time.” He is of course referencing the seminal Pacific Standard Time exhibitions (the catalog of which will be read and reviewed by me this weekend), which began exhibiting in 2011 and proposed that the West Coast (specifically Southern California) was never inferior to the East Coast (specifically New York City) which was long regarded as the center of the avant-garde in America. In a way, PST is almost re-writing history, and it is being widely accepted because it is difficult to deny that California is not a center in its own right. However, Hickey is blatantly stating that Denver– a peripheral, regional area– cannot possibly attempt the same sort of re-write because we just don’t matter enough. I’m going to be blunt here: David Hickey, you are an ignorant a**hole. Denver– and the whole of Colorado, really– is always being made out to be some po-dunk hick town, and the stereotype is being reinforced by many of our own inhabitants. 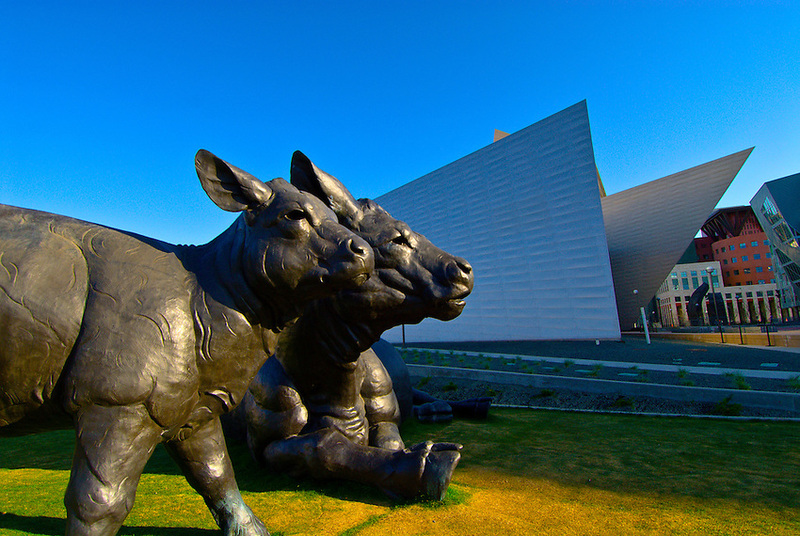 For example, in 2006, the former Denver Art Museum director, Lewis Sharp, made the following comment in The Denver Post regarding the giant bronze “Scottish Cow and Calf” by Dan Ostermiller: “Yeah, we’re a cow town. But there are artists working in a representational manner who are creating works of art of artistic merit, and to embrace that in the broader community of public art gets right back to offering a variety of experiences.” While he is sort of trying to break the Denver stereotype with this statement, he is simultaneously reminding everyone that, artistically, we’re still behind the ball. Colorado art is constantly seen as subpar and irrelevant in the grand scheme of art history. My own proctor for my comps, who I should mention is NOT my thesis advisor, tried to talk me out of my thesis topic, asking that I do something a little more “traditional.” To support this, he said that too many grad students end up doing stuff on local topics because they are afraid of going outside of their comfort zone. I rebutted by saying that I am interested in exploring why Colorado art “doesn’t matter” outside of the state and rattled off the concepts of regionalism, minor history, post-structuralism, and post-modernism to back up my stance. Never before have I been gripped by an indescribable desire to go back in time and visit the ’60s (and early to mid-70s, for that matter). Actually, I rarely ever think to myself, “How cool would it be to go back to the (insert memorable time period)?” Why? Because I love living in 2012: the environment hasn’t quite gone totally to hell yet; major advancements have been made in medicine; and substantial progress has been made for women, the LGBT community, civil rights, etc. Don’t get me wrong, there is still a lot of work to be done in these latter areas, but seriously, look at history. We’re doing a hell of a lot better now than we were for centuries. But this exhibition brings back the spirit of the ’60s that I always idealized in my head. If you woke up this morning and said to yourself, “I need some post-structuralism in my life,” then this is the book for you (ok, one of many books…). In Art Encounters Deleuze and Guattari: Thought Beyond Representation, author Simon O’Sullivan tries to reinterpret the philosophical (and political/scientific) ideas of Gilles Deleuze and Felix Guattari in terms of the visual arts. Deleuze and Guattari were in fact rather conservative when it came to their direct views on art, but O’Sullivan manipulates some of their key concepts– the rhizome and the minor history, to name a couple– towards artistic ends. The emphasis in this book is very utopian: art is supposed to be about the collective whole, which therefore makes the creation of art a political act. For art to challenge and liberate us, it needs to break with the dominant norm.